There was a time when I was trying every corn muffin recipe I could get my hands on. This recipe was the BEST I FOUND. The flavor is everything you could ask for in a corn muffin. You can taste the honey and you can taste the butter. I LOVE my corn muffins sweet and these are sweet enough on their own, but that doesn't stop me from drizzling more honey on top. Even though, these are the best I have found so far, that won't stop me from trying new recipes. If you think you have one that can compete with these - send it my way! Preheat oven to 400 degrees. Whisk together eggs, buttermilk, honey and melted butter; set aside. In a medium bowl, combine the cornmeal, flour, baking powder, brown sugar, sugar and salt. Make a well in the center of the dry ingredients. Add the wet ingredients and stir together just until combined. Divide batter between 12 greased muffin cups, filling 3/4 full. Bake for 12-15 minutes or until golden. DO NOT OVERBAKE. Yield: 12 muffins. Jenn's Notes: These muffins taste incredible. Make sure to not overbake or they will be dry. 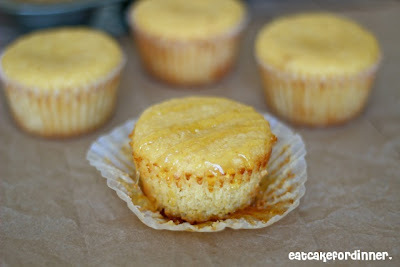 I love a good corn muffin - and it has to be sweet. These are perfect! 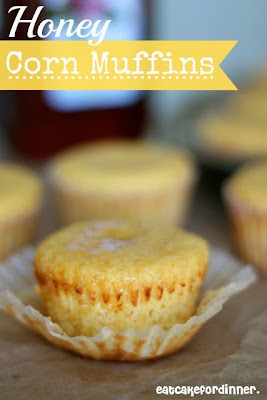 I have never tried a corn muffin before, but these look so nice! I can't believe you have never had a corn muffin! I think you need to make some ASAP! So yummy.